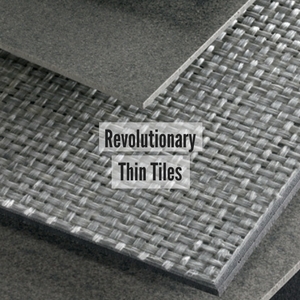 One of the most innovative products of the last decade has been thin porcelain tiles (3mm – 5mm thick). These tiles are remarkable not only for their thinness, but also their large formats—length to width ratios. The resulting product is incredibly lightweight, easy to cut, and easy to install and fix. The product is resistive, light, flexible, pliable and versatile due to a revolutionary production process. These tiles can be used as a wall or floor covering as well as countertops, and are ideal for renovation projects since they can be installed directly over existing surfaces, eliminating the need for demolition and disposal of materials. Lea Ceramiche, our partner for providing Italian-made thin porcelain tiles to the U.S. market, is the manufacturer of Slimtech tiles. Slimtech are slabs of laminated porcelain in record sizes (118in. x 39in.) due to extraordinary lightness resulting from a thickness of only 0.12 in. If you would like to learn more about how Slimtech tiles could be suitable for your project, here is a convenient form for contacting Atlantic Link.